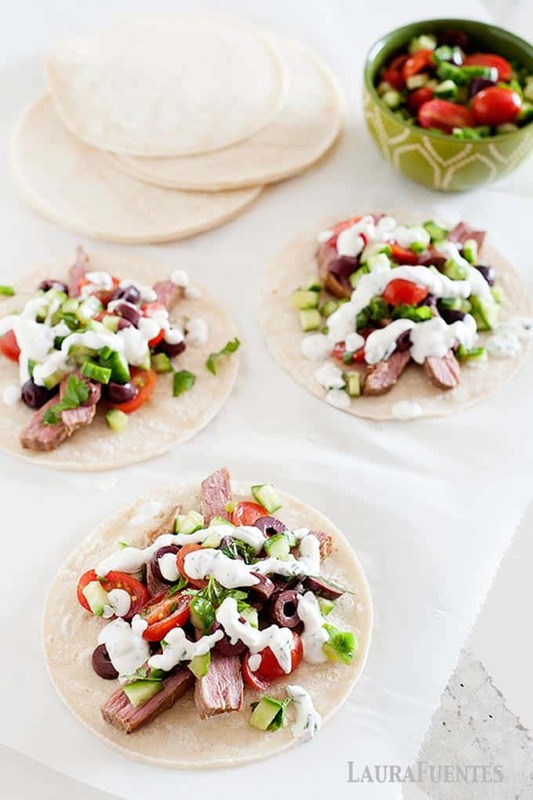 This Greek Flank Steak Tacos recipe is one you are going to want to make again and again. 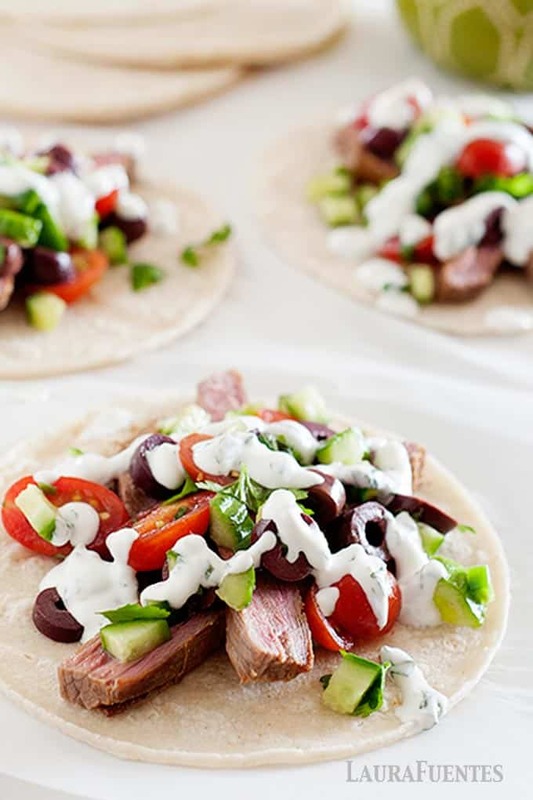 Watch as these steak tacos are piled with cucumber salsa and drizzled with Greek sauce. It’s all your favorite Mediterranean flavors in one EPIC taco Tuesday recipe. 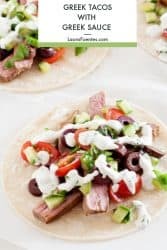 While I love classic mexican flavors and fish tacos, these Greek Steak Tacos are super refreshing and include one of my favorite recipe profiles- Greek food! 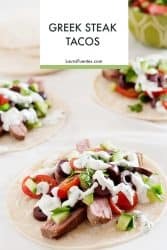 Asian, Latin, Thai, Greek- I love all types of food and it’s totally obvious in my Taco Tuesday Cookbook, which is full of Asian-fusion, breakfast, vegetarian, and fish tacos. Seriously though if you haven’t tried and tasted the Asian Thai Rib, Baja fish, or Jerk chicken tacos you are totally missing out! I’m getting a little ahead of myself, back to these Greek Steak Tacos. If you’ve been hanging around the taco party for a minute, you know by now that I like to keep my recipes simple so you can fit it in your busy schedule. I believe tacos are a part of a healthy diet and lifestyle and they are simply irresistible! For this recipe the flank or skirt steak requires no marinating, so they’re ready to grill up, no time. I recommend sticking to these two cuts of meat whenever you want steak tacos. The meat is especially tender and easy to cut into perfectly thin slices. No grill? No problem, the Taco Tuesday Cookbook recipe for these steak tacos include directions for both the grill and skillet. Speaking of, if you haven’t checked out a copy already, what are you waiting for?! It’s nothing BUT amazing taco recipes made in the slow cooker, sheet pan, one-skillet, a.k.a made so us busy moms can have our tacos and eat them too! Even if it’s during a busy mid-week night. While the flank steak is the clear star of these tacos, it’s only made perfect by pairing it with not just one, but two epic toppings. 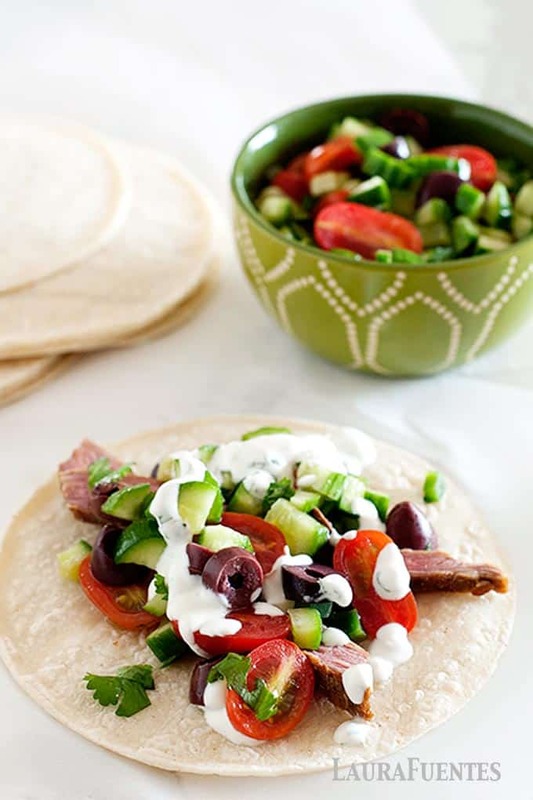 In order for these to be the BEST greek tacos you’ll ever eat, the Cucumber Salsa is a must. It’s crazy simple and so so good! Make your life easier and prep it the night before. 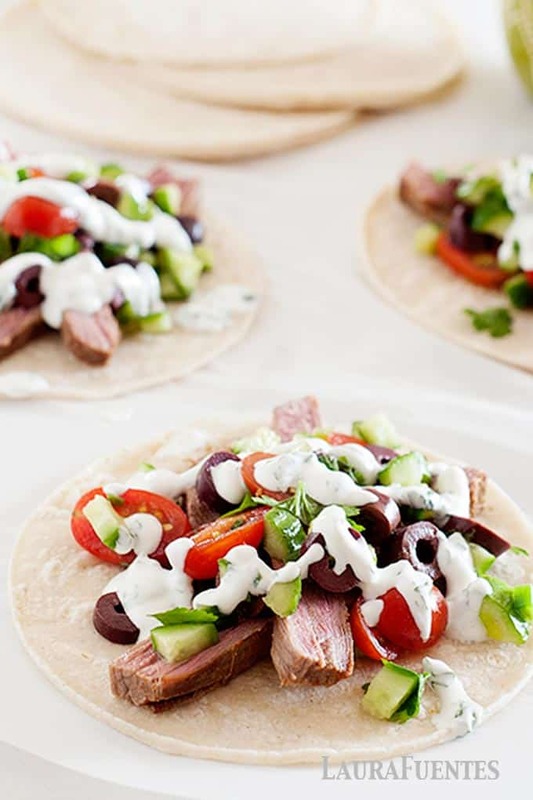 Any leftovers can be used as a topping for more Greek Steak tacos, in a wrap, or even on top of salads. Before you go anywhere we gotta talk about that drool-worthy drizzle that goes on top. 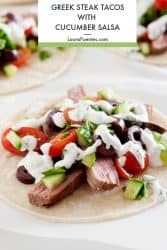 These tacos are graced with a generous helping of my homemade El Griego sauce, which is similar to tzatziki but easier and tastes even better. It goes great with these tacos but also on any other Mediterranean dishes or even as a dip with veggies. It’s another one of those all-purpose recipes from the Taco Tuesday cookbook. If you want your day or week to consist of amazing taco recipes then you’ve got to grab a copy of the Taco Tuesday Cookbook and keep up with the latest taco recipes on my youtube channel.